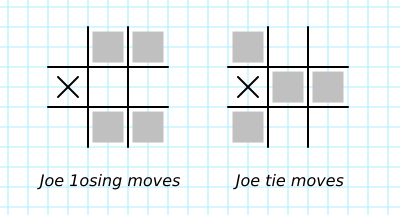 I wrote my Tic Tac Toe tutorial mostly for beginners: I thought that the game is simple enough for experienced players to know all the tricks in the book. It turns out that even expert players make mistakes. 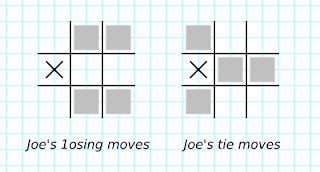 Recently I googled "tic tac toe strategies". The very first search result came out as a coveted "featured snippet" and pointed to https://www.instructables.com/id/Winning-tic-tac-toe-strategies. 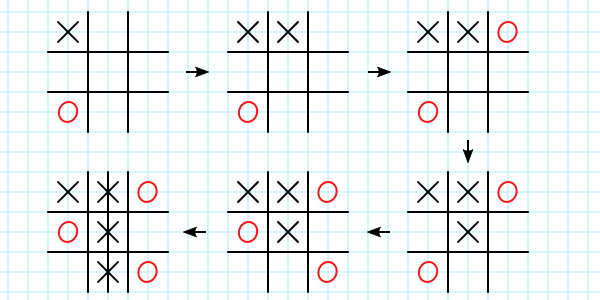 The author of this page shows different fork configurations and classifies winning strategies for the first player (X-player) based on which fork configuration she should try to achieve. You might remember from my tutorial that a fork is a configuration in which a player can win on her next move by marking either one of two free squares. 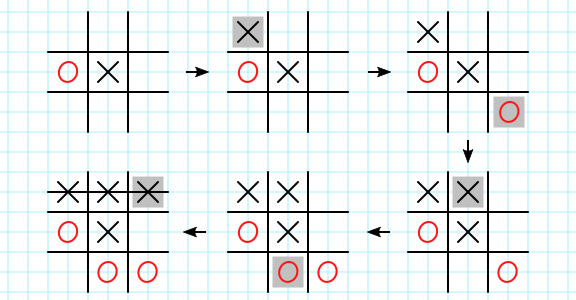 If a player creates a fork and her opponent does not have a way for an immediate win, he will obviously lose (if he blocks one winning square, she will win by marking the other). Here are some examples of forks created by X-player -- the two winning squares are highlighted in gray. Back to the winning strategies recommended by the web page. "Strategy 1", as the author calls it, is a good one. 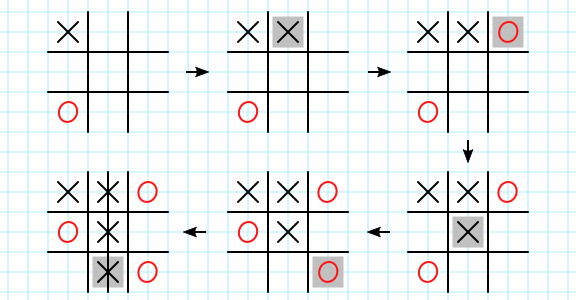 It starts with a corner move and could really lead to a win if (of course) the second player (O-player) allows X-player to achieve the suggested fork configuration. But the so called "Strategies 3+4", are actually bad ones -- they could lose you a game. Let me explain. I will follow the author's method of describing moves by numbering the squares of the 3x3 grid. 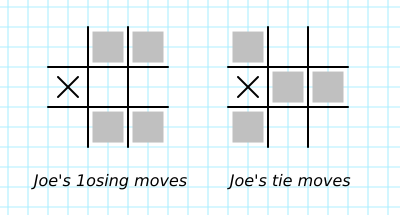 The author recommends taking squares 4 and 8 first, so that you can subsequently create one of two forks, as shown on the picture. But the second player has a very effective counter strategy. If X-player starts with 4, O-player should respond with 1. Now if X-player takes 8 (as recommended by the author), she will fall right into a "trap" and deliver O-player an easy win! Do you see why? I do not want to spoil the fun of finding the solution. But here is an answer, in case you want to compare your solution with mine. Obviously, X-player can avoid this "trap" by not blindly following "Strategies 3+4" on her second move. That is why I put "trap" in quotes. Similar "traps" exist when X-player tries to setup a fork with different pairs of edge squares. 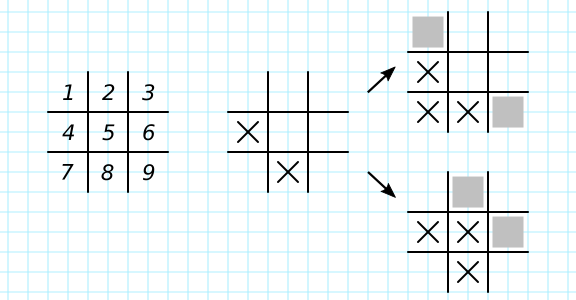 Be careful when you play against the AI in my Tic Tac Toe app - it could "trap" you :-). Recently I was trying to solve a puzzle involving 3x3 semi-magic squares - 3x3 grids filled with integers 1,2,...,9 in such a way that each cell contains a different integer and the sum of the numbers in each row and each column is the same. It is easy to see that for a 3x3 semi-magic square this sum (sometimes called the magic constant) should be 15. The definition of a semi-magic square does not require (but does not preclude) that the sum of the numbers in each diagonal should also be equal to the magic constant. If that's the case a semi-magic square becomes a magic square. Here are a few examples of 3x3 semi-magic squares. The middle square is not only a semi-magic square, but also a magic square. I could not find a list of all 3x3 semi-magic squares, so I wrote a little program to generate my own. If you ever need a list of all these squares, - here it is, arranged in lexicographical order. It turned out, there are 72 different 3x3 semi-magic squares. But how "different" are they really? It is easy to see that each of the 8 geometric transformations of a square (identity, 90°, 180°, 270° counterclockwise rotations around the center, reflections across the horizontal axis, the vertical axis, and each diagonal) transforms a semi-magic square into another semi-magic square. We can therefore split 72 semi-magic squares into 9 non-intersecting equivalency classes. Members of same class are reflections or rotations of each other; members of different classes are not. Below are representatives of each of the 9 classes . Every semi-magic square in a class is a geometric transformation of its representative. All 72 semi-magic squares can be produced out of these 9 by applying geometric transformations. From this perspective there are only 9 "substantially different" semi-magic squares. But why stop at just geometric transformations? What other transformations turn one semi-magic square into another? Column swaps, row swaps (and sequences of them) do the trick. There are 6 transformations (including identity) done by row permutations and 6 transformations done by column permutations. The picture below shows the 6 row permutations. It turns out the 6 row permutations are independent from the 6 column permutations and taken together as sequences of row/column permutations, they constitute 36 different transformations. Based on this transformation group we can split 72 semi-magic squares into just 2 non-intersecting equivalency classes. Members of the same class are sequences of row/column permutations of each other, members of different classes are not. Here are the 2 classes representatives. All other semi-magic squares are produced out of these two by series of row/column permutations. Look carefully at the two representatives above... they are reflections of each other across the main diagonal! What does that mean? It means that all 72 semi-magic squares are the result of applying row/columns permutations and geometric transformations to just one semi-magic square. And we a free to choose any one of them as "the one". Let's actually make it a magic square, just for fun!